Mageplaza Gift Card extension is a useful tool which helps online merchants attract more buyers, particularly in holiday shopping seasons and special occasions. Setting gift card expiration requires some steps and should be done carefully to optimize benefits of your store. Let’s find helpful information about this feature below and help yourself with Mageplaza Gift Card extension. 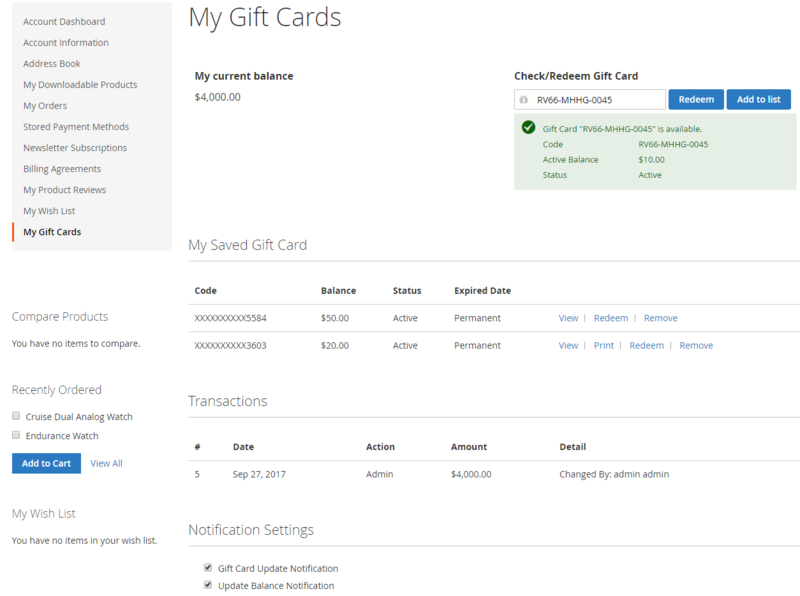 Gift card and gift code expiration can be configured in couples of places from the backend. Please go through all the article below to have a better look of this feature. In the Manage Gift Code Pools table, among other essential information such as ID, Name, Status, Balance, Store View, Created time, you are able to see expired dates of all gift code pools at the 8th column. A gift code pool is a bunch of gift codes created simultaneously which contain similar information such as Balance, Expired dates, templates and others. Store admins are able to create a pool to generate a series of gift codes in the quickest way. In case you want to edit the expired date of a gift code pool, you can click the blue Edit button in the column Action of the grid. The change can be made at the box Expired At in the section Gift Card Information. Similarly, you can find the same place to set the expiration date when it comes to generating a new gift code pool. 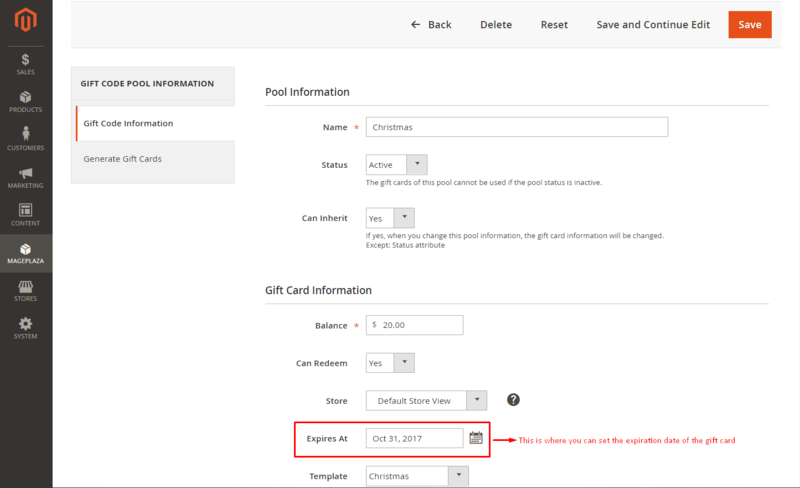 Beside allowing store admins to set expiration date for gift codes, Mageplaza Gift Card extension also enables you to set expiration for gift cards. 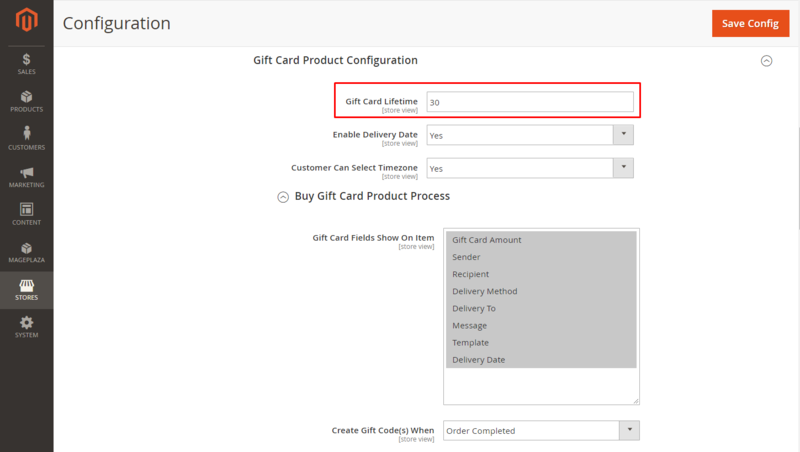 After creating a new gift card at Product > Catalog > Add Product > Gift Card Product, filling necessary information such as Name, SKU, Quantity and Category, you should configure the expiration date in the Gift Card Information section. You can also tick the checkbox Use Config Settings to use the expiration date set in Configuration (see below). Otherwise, just type a figure to represent the number of days of the gift card’s lifetime. You can also set the expiration date for gift cards as a default configuration from the backend. This expiration date will be applied for all gift cards generated in case you allow using Config Settings and refuse to set it up for each individual gift card. 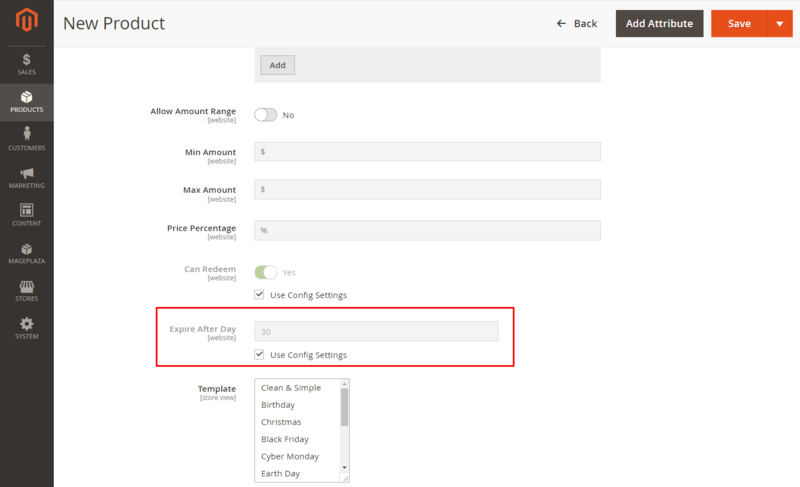 The expiration date of gift cards can be configured at Mageplaza > Configuration > General Configuration. Store admins just need to type a number of days in the box Gift Card Lifetime, then the expiration date will be all set. Gift card buyers are able to see their purchased gift voucher’s expiration date in My Saved Gift Card. In the screenshot below, the expired dates are displayed at the third column of the grid.